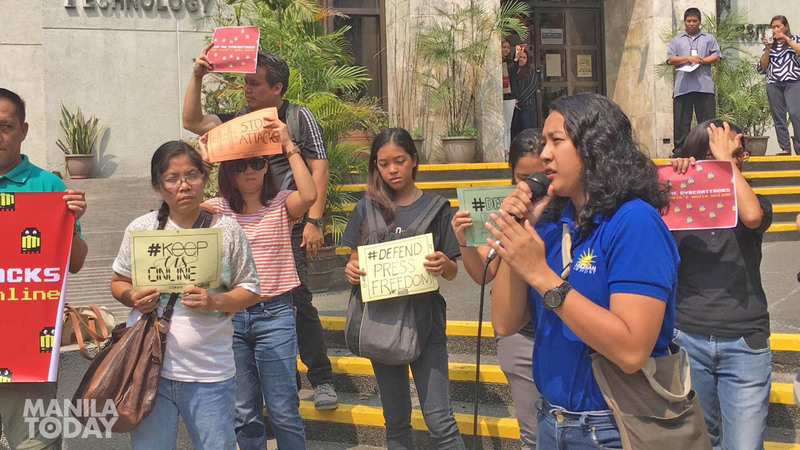 Alternative media groups held a picket protest in front of the National Computer Emergency Response Team office of the Department of Information and Communications Technology at C.P. Garcia in Quezon City this morning. The groups decried the agency’s inaction amid cyber attacks they have experienced since December of last year. Rea Padilla of Altermidya People’s Alternative Media Network joined the protest at DICT. Photo by Jade Dela Cuadra. Some independent media site such as Bulatlat have suffered severe distributed denial of service attacks that shut down their website for days up in several weeks. Members of alternative media groups joined the picket protest at the DICT. Photo by Jade Dela Cuadra. Present in the protest were Altermidya People’s Media Network, Kodao Productions, Pinoy Weekly, Bulatlat, Tudla Productions and human rights group Karapatan. Prof. Danilo Arao of UP College of Mass Communication joined the protest at DICT. Photo by Jade Dela Cuadra. The protest was held in conjunction with the World Day Against Cyber Censorship.